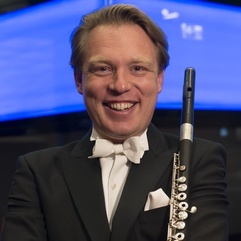 Principal flute of the Münchner Philharmoniker and former professor of flute at Royal Conservatory The Hague and Codarts Rotterdam Conservatory. Whilst studying I was appointed Principal Flute with the Orchestre Philharmonique de Liege in 1999. I resigned from the orchestra to join the Royal Concertgebouw Orchestra from 2003 until 2010. From 2010 until 2013 I held the position of Principal Flute with the Rotterdam Philharmonic Orchestra and in September 2013 I was appointed Principal Flute of the Munich Philharmonic. As a passionate and dedicated teacher I am regularly invited to give masterclasses all over the world. From 2007 until 2010 I was teaching at the Royal Conservatory of The Hague and from 2010 until 2013 at the Rotterdam Conservatory Codarts. I am looking forward to meet you in my lessons! Mr. Herman van Kogelenberg was very helpful during my private lesson with him. He explained not only how to play the notes, but also how to show the music in every line and showed me how to add more emotion into my playing. Mr. Kogelenberg also has a lot of orchestral experience and gave me tips for flute and piccolo, as well as general audition advice. Throughout the lesson, he was funny and lively and I highly recommend him for anyone who wants to learn more about playing music on the flute. I am very glad that I had the opportunity of taking flute lessons for 1,5 year with Herman van Kogelenberg at the conservatory of Rotterdam. He helped me play very natural and I found his musical interpretation very interesting and inspiring. He developed my musical personality a lot, he learn me that the music is always the starting point also in technical things. He gives lessons with a lot of energy, fun and passion. I recommend him as a great flutist and teacher! Herman van Kogelenberg has been extremely important in my development as a musician. He was a great support by preparing orchestra auditions. He can explain very good how to play the difficult orchestra excerpts because he has a lot of experience in playing in orchestras. He did help me a lot with playing the music very naturally and with express myself as an individual and not a copy of someone. Take live online video lessons with professional, passionate Flute teachers from around the world. All you need is a computer equipped with a webcam and microphone. Learn more about how it works.